The upcoming weekend is a big one for the NFL. It will determine which two teams are heading to the Super Bowl. My fingers are crossed for my home team, the New England Patriots! Whether you love football like I do, or just love football food, this is a great time of year to try out some fun snacks for family and friends to enjoy while watching any of the big games. 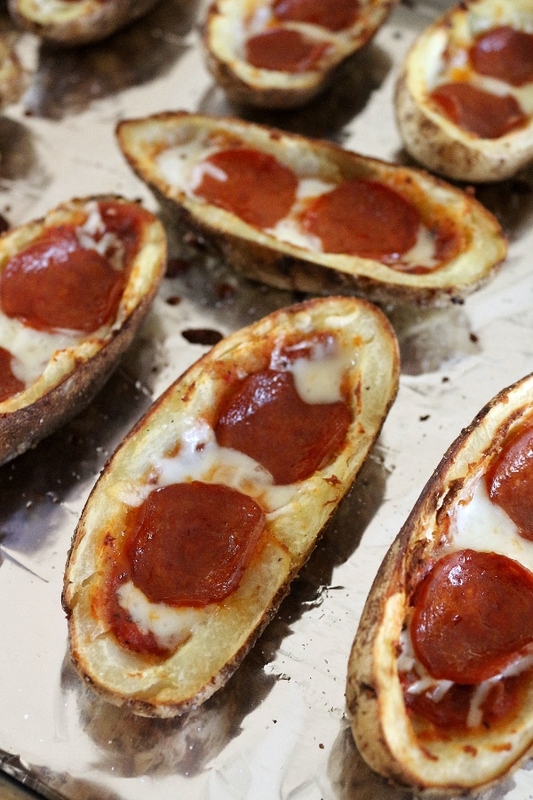 Potato skins are a classic game day delight. Melted cheddar, crispy bacon, and cool sour cream are the usual suspects, but I decided to fill my potato skins with pizza-inspired replacements. 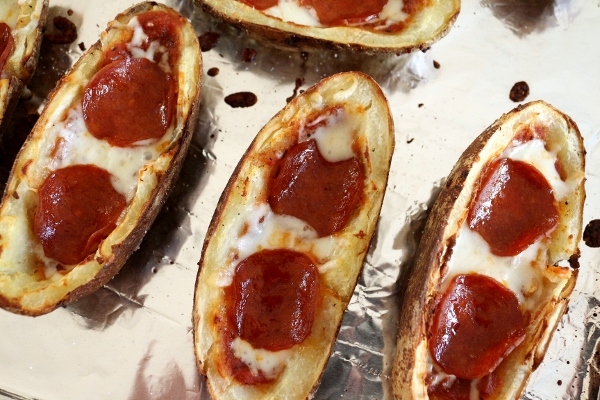 Tomato sauce, mozzarella cheese, and sliced pepperoni are the highlights in these baked-not-fried boat-shaped vessels. My nephews partook in my recent potato skin explorations, and since neither of them can eat gluten this was a really easy way to give them the excitement of pizza without the traditional crust. I actually described it to them as "giant french fries topped like a pizza." That's a pretty apt portrayal of what was on their plate. These are super easy to make and barely require a recipe, but I'm sharing one anyway. You can tweak the toppings to suit your preferences if pepperoni isn't your thing. Preheat the oven to 400 degrees F. Prick the potatoes all over with a fork. Rub gently with olive oil, sprinkle with salt and pepper, and set on an aluminum foil-covered sheet pan. Bake for approximately 45 minutes or longer, until tender (it should be easily pricked with a fork. Remove from the oven and let cool slightly. Cut each potato in half and carefully scoop out the flesh leaving about 1/4 inch of flesh within the skin. Brush the inside of the potato halves with olive oil, and sprinkle generously with salt and pepper. Bake for another 10 minutes, then turn on the broiler for another few minutes as needed to continue to crisp up the top. Don't overdo it because it will be baking more with the filling. 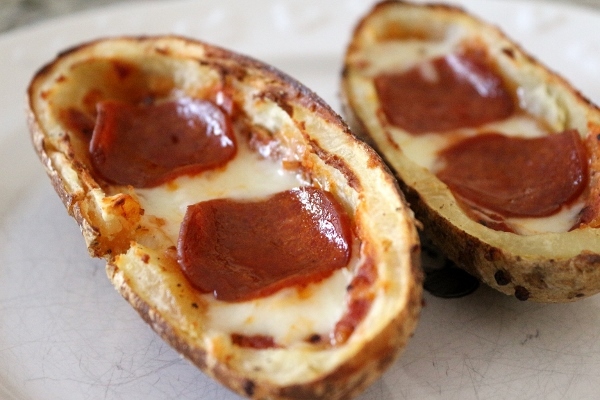 Fill each potato skin with about 2 tablespoons of sauce, a few tablespoons or so of mozzarella cheese (use your judgement here), and a couple slices of pepperoni. You could also sprinkle some dried oregano on top if you'd like. Sliced olives would also be a nice touch! 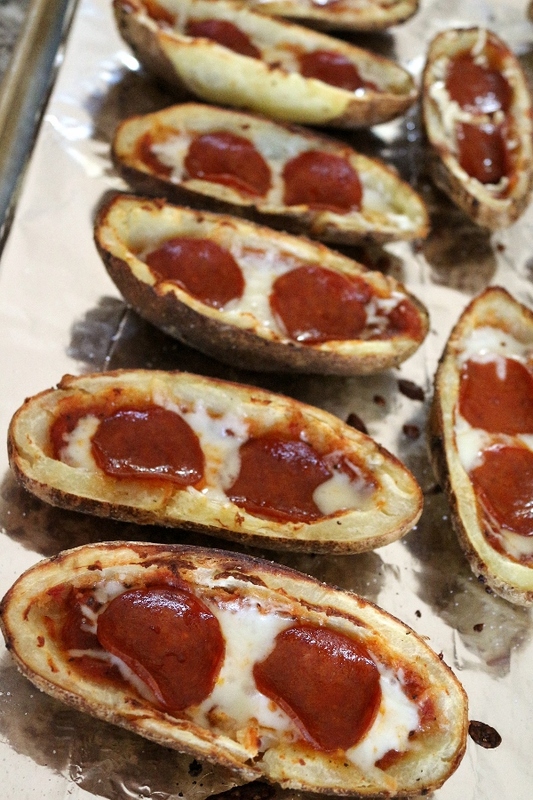 Bake the filled potato skins for another 10 to 15 minutes, or until the cheese is melted and bubbly. Serve warm or at room temperature.